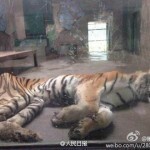 人民日报: Netizen Reveals Tiger at Tianjin Zoo Thin as a Rail: Netizen @曉Q_Fiona writes, “This photo was taken today by my friend at the Tianjin Zoo. Seeing this really makes me sad to the point that I cannot hold back my tears. I don’t know how I can help it! I just sent a message to [World] Animal Protection, but I don’t know if it will be of any help. 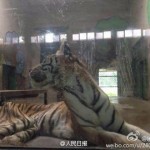 Please, if you can, help me think of a way we can improve the living conditions of the tigers!” We would ask related departments to please verify this, and call for kind treatment of animals! 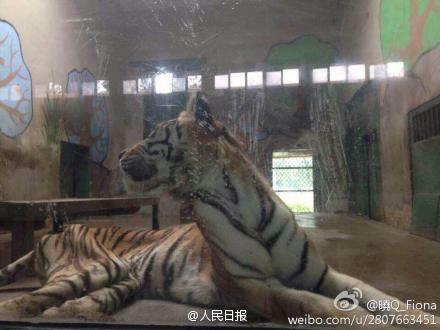 叫我琦大宝: I think we should really just get rid of zoos. If you think about it, there’s really no reason for zoos to exist! 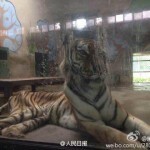 张匯: Is this the only tiger that is emaciated? If many animals in the zoo are all this skinny, then it’s the zoo director’s fault. 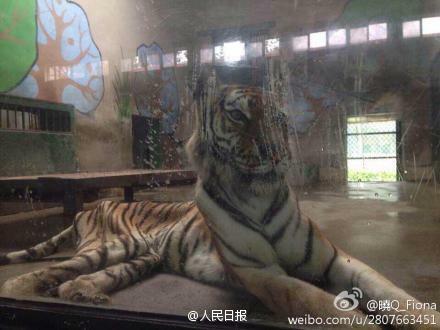 But if it’s only this tiger, perhaps it’s sick, or there’s some other reason. 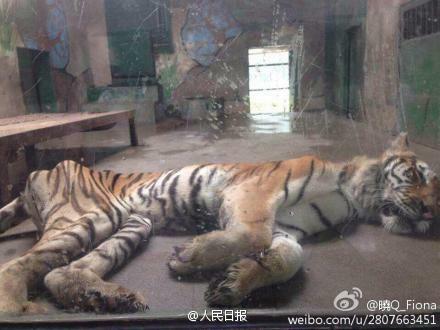 熊猫_LAN: His meat has all been eaten by the warden. 北京指神A: If there was no [Communist] Party, then these “big tigers” like Zhou Yongkang and Xu Caihou wouldn’t have become fat cats in the first place. They have been a scourge on this country for all these years, yet they are just now being removed… The party shouldn’t be bragging about how wise they are, they should be offering the people a sincere apology!!! 木子老龙: We knew Zhou Yongkang had been taken out a long time ago, but we also knew that those at the top didn’t let us know. So we all acted as if we didn’t know for the time being, waiting for the top to give us the OK: “Now, you may know.” Once they did, we broke into song and dance, celebrating the capture of a “big tiger.” And after this, in order to protect ourselves from harm, we still have to wait for the top to approve the things we should and should not know. What an adorable country this is. 赵楚: There’s no doubt that Master Kang had it coming. The problem is that this isn’t news to begin with. What needs to be examined is the fact that this super-old news and these long-standing “rumors” have now turned into a huge news story. It has been made public now, but society and the academic sphere can’t even discuss the matter freely in any official manner. In other words, what system was it that placed this corrupt individual on the top? Was it not the same insolent authoritarian system that took him out? 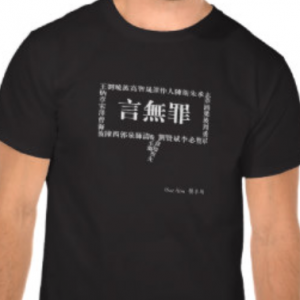 杨-绍-政: What is freedom of the press? Before he was investigated, all reporting on Zhou Yongkang was great, glorious, and correct. Not a single [Chinese] media outlet reported anything on his investigation as it was going on for over a year. But as soon as the Communist Party of China announced that an investigation had been opened, the media immediately perked up, freely spreading negative reporting. 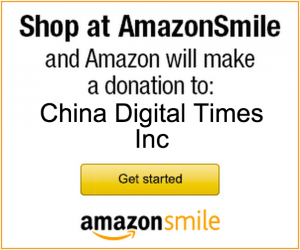 This is press freedom with Chinese characteristics. Am I right? 好雨霏霏N: The newly enthroned emperor catching corrupt officials from the previous dynasty—the best way to establish one’s might and win the hearts of the people. It’s a tried-and-true method of the last two thousand years: the more you people take out and the higher the position of the guys you nab, the greater the applause and love from the people. The truth is the people are the playthings of those in power. But can the people eat distractions? Imperial power is always strengthened by attacking adversaries and stabilized by fooling the people. Read more deleted comments at CDT Chinese.